The military claims that the principal aim of these measures is a comprehensive check of how forces interact in carrying out successive combat-training missions in an unfamiliar location and on ranges that have not yet been tested. The Russian Army’s recent tactical exercises in the Rostov, Belgorod and Kursk regions have attracted heightened attention from her neighbours, with Kiev being particularly alarmed. The acting defence Minister in Ukraine Admiral Igor Tenyukh even suspected Moscow of preparing for an offensive. According to Admiral Tenyukh, Russia had amassed an alignment of forces consisting of 220,000 troops, 1,800 tanks and more than 400 helicopters allegedly for these exercises. The figures that he presented do not correspond to reality in any way. A month ago when President Vladimir Putin put the forces in the Western, and Central Military districts (including the Baltic and Northern Fleets, airborne troops, military and space forces, fighter and military transport aviation) on alert to an unannounced inspection, according to official sources 150,000 troops, 870 tanks, 90 aircraft, 120 helicopters and 1,500 items of military technology (ships, artillery ordnance, armoured personnel carriers and vehicles) were mobilised for the manoeuvres. Admiral Tenyukh could not fail to have known that back on March 7, 4 days before he made his statement in the Verkhovnaya Rada all forces that had participated in these exercises had returned to their barracks. An official announcement was made about this by Russia’s Military. The Ukrainian military were offered the chance to fly wherever they wished in a reconnaissance aircraft over this zone so that they would be reassured about the exercises and so that they would understand that Russia has no intention of concentrating significant forces and equipment to invade the Kharkov, Lugansk and Donetsk regions. The Ukrainian military would be able to see for themselves that they are seriously mistaken as far as Moscow’s true intentions are concerned. 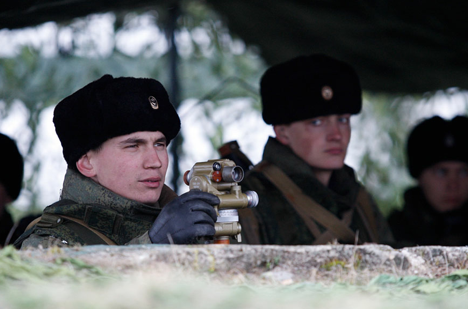 In the meantime the Russian Army exercises are not only taking place in the Rostov, Belgorod, Tambov and Kursk regions. Russia’s airborne troops, more than 350 servicemen and four technology platforms for example completed an airdrop into the Zapolyare (Sub-Polar region) and onto the Novosibirskiye Ostrova (New Siberian Islands) for the first time in the history of this branch of the Armed Forces, in temperatures of 30 degrees below zero. No other Army in the world has achieved something of this magnitude. Moreover another detachment of airborne troops completed an airdrop into the Ulyanovsk region and another to Rostov. Then those forces located closest to the Ukrainian border gathered up their parachutes and again embarked onto an Il-76MD aircraft to airdrop into the Yaroslavl region a few hours later. At the same time pilots from the Central Military District carried out bombing raids on the Chebarukl range, which is outside Chelyabinsk. Artillery and rocket specialists from all Military Districts trained by opening fire from an enclosed firing position on 10 ranges in the Southern Military District. They employed direct fire from ‘Grad-M’, ‘Tornado’, ‘Uragan’, and ‘Smerch’ multiple rocket launchers, ‘Msta-S’ 152-mm howitzers, ‘Rapira’ 100-mm anti-tank guns and the ‘Nona’ self-propelled gun. Furthermore the majority of this live firing was carried out at night. The Head of Rocket Forces and Land Based artillery Major-General Mikhail Mikhailovskiy announced that his servicemen are carrying out more than 50 tactical exercises and 20 control drills on firing and gun control. The military claim that the principal aim of these measures is a comprehensive check of how forces interact in carrying out successive combat-training missions in an unfamiliar location and on ranges that have not yet been tested. Both commanders and servicemen in motorised, artillery and tank detachments gain experience in marching from their permanent base to the appointed regions, and in subsequently deploying in an unfamiliar location. Specifically issues of interaction with representatives of the Russian Railways can be solved, as well as the idiosyncrasies of loading military technology onto railway wagons. These planned practical drills develop best practise for servicemen in operating military and special equipment, carrying out reconnaissance of transport links, engineering reconnaissance, fortification of a position and special tactical training as part of their assigned units. Particular attention will be paid to secrecy in terms of the deployment of detachments and camouflage in places where forces are concentrated and where the exercises are due to take place. At the moment commanders are developing a way of managing different types of conflicts, detachments and gun control to achieve combat objectives. In this case a complex environment needs to be created, which is similar to a real combat situation and which imitates the actions of a fictitious enemy. In the closing stages of these battle drills servicemen work through a series of complex exercises in the operational coordination of detachments, weapons training with live firing and also in their commander’s ability to control artillery fire. These exercises continue until the end of March.